There’s little that can turn Crown Prince Rudolf’s thoughts from his obsession with death. But when the young Mary Vetsera arrives unexpectedly at his room during Mayerling's Act II climax, she answers that obsession in a way he never dreamed possible. What follows, the ‘Bedroom pas de deux’, is a duet of startling intensity and explicitness – even by the standards of Kenneth MacMillan, a choreographer renowned for creating shocking ballets, from The Invitation to The Judas Tree. Thanks to a cover-up by the Imperial family – hinted at in MacMillan’s ballet by the depictions of a clandestine, night-time funeral that open and close the piece – the true events of Rudolf and Mary’s story are lost to history. But it seems that Mary, just 17 years old, willingly followed the 30-year-old Crown Prince to her death in a gruesome murder-suicide. In MacMillan’s telling, Rudolf’s morbid obsessions fully meet their match in Mary, who, although naive, is under few illusions as to the nature of his desire. It is in the Bedroom pas de deux that Rudolf comes to understand this. For the first time since the pas de deux with his mother in Act I, Rudolf is in the thrall of someone other than himself. Mary plays teasingly not only with the skull, but with Rudolf’s revolver, which he had earlier used to terrify his new wife Princess Stephanie. She fires a shot, shocking the normally indifferent prince, and he hastens to take the gun away from her. You could have hurt someone, he seems to say, his eyes aglow. Finally, he has found someone with his own sense of recklessness. He lifts her with new tenderness and they passionately kiss. Their combined recklessness results in an extraordinary sequence of steps, transcending, subverting and perverting balletic norms. What might have been a chivalrous lift becomes a sudden hoist, legs first into the air, leaving Mary clinging to Rudolf’s thighs and dragging herself between his legs. And while Rudolf later holds Mary aloft in a position reminiscent of one of the most famous moments from MacMillan’s ballet of Romeo and Juliet, Rudolf’s own position – lying on the floor, knees awkwardly risen – is a world away from Romeo’s innocent passion. Mary may be young and naive, after all, but Rudolf is no lovestruck teenager. Act III, of course, becomes darker still – at the end of Act II we are yet to encounter Rudolf as the huntsman who accidentally shoots a companion, or Rudolf as the drug addict. And in this first pas de deux the couple have not yet hatched their murder-suicide plan. 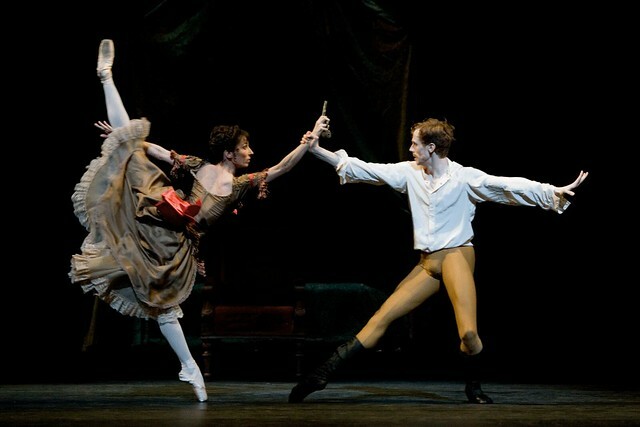 The couple’s final pas de deux, which they dance at the Mayerling hunting lodge moments before their deaths, is even more alarming in its extremes. But it is also the inevitable culmination of an affair in which what brought the couple together, right from the start, was a passion for wanton destruction. Mayerling runs 8–30 October 2018. Tickets are still available. I think it is beautifull. The story, it happened. For real, is romantic with a sinister background..........two people obesessed with death. I hope i will see it. One time preferably in the Royal Opera House, which i hope will be ready and rise , even more, with Royal appearance.